On Saturday, Security Council members imposed sanctions on North Korea for the seventh time since its first 2006 nuclear test. New ones aim to deprive Pyongyang of around one-third of its export revenues, cutting them by about $1 billion. They ban DPRK exports of coal, iron, iron ore, lead, lead ore, and seafood. They prohibit all new joint ventures, ban new investments in current ones, and prohibit sending more workers abroad for jobs. They tighten restrictions on technology to prevent Pyongyang from acquiring military related items. North Korean vessels caught violating SC resolutions will be banned from entering foreign ports. Imposing sanctions is one thing, enforcing them another. North Korea is adept at exploiting loopholes in restrictions and minimizing them other ways. Most important, China wants Pyongyang’s economy kept from imploding. It accounts for around 90% of its exports. It’s the DPRK’s key ally. Beijing and Russia oppose its nuclear and ballistic missile programs. They want these issues handled diplomatically – most of all non-militarily, the main reason they went along with sanctions to preserve a measure of stability on the Korean peninsula. China’s UN envoy Liu Jieyi explained new sanctions aim to prevent chaos and conflict on the Korean peninsula, why his government supported them. 1. 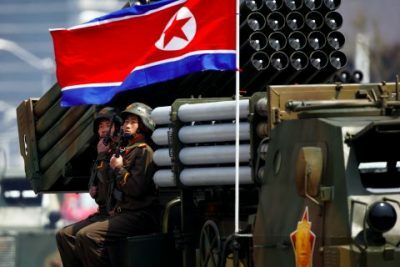 New sanctions against Pyongyang’s nuclear and ballistic missile programs. 2. No intention to harm DPRK activities not prohibited by the resolution – including economic activities and cooperation, food and economic assistance. 3. A call for resuming six-party diplomacy, a commitment to resolving contentious issues peacefully and taking steps to deescalate Korean peninsula tensions. On July 4, following the DPRK’s ballistic missile test, China and Russia issued a joint statement. It called for denuclearizing the Korean peninsula and suspending Pyongyang’s ballistic missile tests in return for peaceful negotiations and suspension of provocative joint US/South Korean war games the DPRK believes are prelude for an attack on its country. China and Russia seek an “integrated,” realistic and feasible resolution to Korean peninsula issues. They want provocative US THAAD missile systems in South Korea withdrawn, undermining regional strategic balance and threatening their national security. Increased US regional militarization is polar opposite what’s needed to resolve contentious issues. “We hope the parties concerned will immediately take effective action to prevent the situation from further escalating, create conditions for the resumption of talks and exert efforts to bring back at an early date the nuclear issue of the peninsula to the right track of seeking a peaceful solution through dialogue and consultation,” Liu stressed. Attacking North Korea militarily would be catastrophic for the region, Nebenzya warned. It would risk US confrontation with Russia and China. On the one hand, Trump welcomed Sino/Russian cooperation on North Korea. At the same time, he reportedly intends using US Trade Act (1974) authorization to impose selective tariffs and/or import duties on Chinese steel and other products – risking a possible trade war, assuring losers, not winners.